Back from a rollercoaster week in New York. Irene (Bloesem) and I had an amazing week in many different regards. Main goal was the New York International Gift Fair that I was attending. Because of my work in the booth I didn't have time to see the city, walk around on the huge gift fair, or take any photo's. The response on my work was overwhelming. The new Circles I launched in NYC caused a lot of American 'wooooows' which made me smile all day long! View from our apartment - this was such an everyday treat! We had many visitors on the booth! 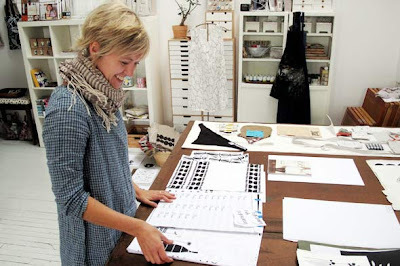 Small boutiques, huge (museum)stores, press and collegues like...yes: Lotta Jansdotter! Want to know how she is in real life? She is just very S W E E T ! With capital letters. Irene and I did some sample shopping - a usual phenomenon during the last hours of trade shows - at my neighbours Fog Linen (trays) and at Rifle paper (gift tags). I have a serious weakness for gift tags...bought some nice ones from Darrell from Sukie, who's booth was a couple of meters away. The temporary tattoos (on the Sukie box) were a present from Tina Roth Eisenberg, from the well known blog Swiss-Miss. She launched her cool and funny Tattly's on the Gift Fair. Our last hours in NYC were a kind of a 'surprise icing on the NY-cake': we attended the US-bloggers event of the year called Alt Summit which was held in the offices of Martha Stewart on 26th street! It was so fantastic to finally meet Sweet Paul in person and Rachel Faucett from Handmade Charlotte who has been on my little bloglist here since the very begining. Tina from Swiss Miss held an impressive and powerfull keynote about entrepreneurship, balancing familylife-work and living life to the fullest. She's an amazing speaker and I think her words truly can make a difference! This passed week in NY has been very important to me, not only businesswise, but also personally. T H A N K S! OOOOOHH wat cool dat je daar stond en zo veel leuke reacties hebt ontvangen! Ja, gaaf hè, Lotta was echt heel lief en geïnteresseerd! Nu helaas nog niet uitblazen, maar de beroemde 'follow-up' doen: morgen ga ik de hele dag alle shops/stores die hebben besteld en alle geïnteresseerden mailen. Super belangrijk. En daarna de beurs in Utrecht opbouwen, daar sta ik vanaf volgende week zondag, zodra die klaar is direct door naar Parijs voor de beurs (daar staat & Klevering voor mij, thank god). En DAARNA.....naar de masseur voor de knopen in mijn nek, extra lesjes yoga en lange wandelingen op de hei! Wauw, wat een geweldige ervaring! Oooh. Hier zit nog zo'n Lotta-fan. Dus ze is in 't echt zoals op de foto's. Leuk. Zo'n beurs moet wel heel indrukwekkend zijn. Wat een fantastische ervaring!!! Super! Klinkt als een super ervaring! En wauw, dat uitzicht! Veel succes met alle dingen die nog komen! Hoi Jurianne, wauw wat een ervaring je zal wel kapot geweest zijn van alle indrukken, succes met het veroveren van the USA..gr Ilse. Allways happy if you leave me a note! Spam will be removed and reported.